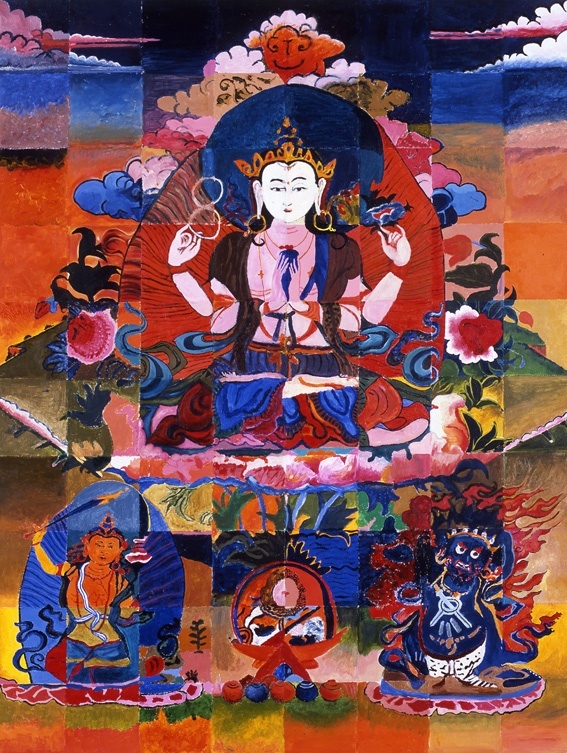 Four arm Avalokitesvara Bodhisattva Tangkha with Manjusri and Vajrapani based on a Tibetan Tangkha.100 cm x 132cm, Acrylic on Linen. Re-created with 80 participants over 5 days on the London Buddhist Centre Winter retreat 2004/05, Sibford, Oxfordshire. I had wanted to do a recreation in a Buddhist context as I consider the practice of recreating images with groups of people to be an examination of the artistic ego. Rather than paint my own image, I invite other people to paint the image with me. The image chosen to recreate was Avalokiteshvara, the Bodhisattva of compassion. A bodhisattva in Buddhist iconography is an enlightened being who delays their own enlightenment until all other beings suffering has ceased. Participants included: Andrew P, Jo, Feja, Bill, Joe, Steve, Christian, Arvind, Kerri, Diane, Clare G, Steve, Warren, Clare P. Agata, Sradagita, Giles, Linda, Patsy, Eilish, Lisa C, Helen W, Vidyajyoti, Michelle, Mete, Sarah Co, Jenny, Phil, Sandra, Mike, Manny, Markos, Tina M., Dave, Teresa, Mervyn, Lam, Sarah L, Maitrayabandu, Thea, Johnny, Barbara, Julia, Fiona, Lorna, Val, Ian, Vajrasarah, Maria S, Caro, Anne Marie, Yuki, Helena, Kelly, Parul, Catherine R, Phil, Marie, Sadhita, Nic, Charlotte, Cath, Aaron, Sam, Sarah W, Louise, Sarah Ca, Maitreyaraja, Jenny, Lara, Susannah, Kirsti, Ashok, Richard T and others.